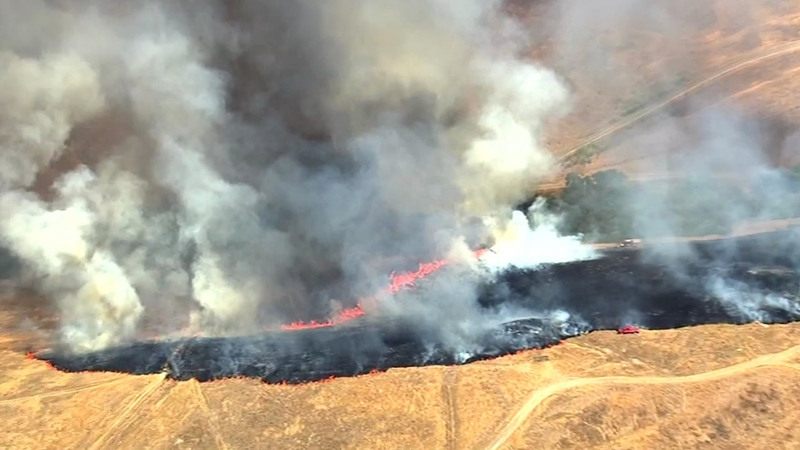 DUBLIN, Calif. (KGO) -- Cal Fire and U.S. military firefighters contained a 750-acre brush fire on the Camp Parks Reserve Forces Training Area in Dublin near the Santa Rita Jail Tuesday afternoon. The fire was reported around 11:30 a.m.
Officials said there is no training at the facility and that no structures or homes were threatened. "They started attacking the fire. They were getting the upper hand on it. We thought we had it under control, then wind came up and the containment lines blew and it started burning again and so we've been chasing this fire all day long," Alameda County Fire Department Battalion Chief Alan Evans said. Tassajara Road was closed between Quarry Lane and Fallon Road because of the fire, according to Dublin city officials. Alameda County sheriff's spokesman J.D. Nelson said the fire did not have an impact on the nearby Santa Rita Jail. US Army Garrison Commander Camp Parks Lt. Colonel Andrew Jones said one firefighter sustained a heat related injury, but is expected to be OK.
Water drops from the air were stopped briefly because someone was flying a drone over the fire. If a drone collides with firefighting aircraft the results can be serious even fatal.